In our growing desire to be sustainable, I thought it would be fun to grow our own heirloom pumpkins. they like to be fed and watered, so to raise our own pumpkins in not really sustainable. These pumpkins we have grown are some expensive pumpkins! We planted them at the end of May and they are just now taking off. Here are the heirloom pumpkins we have planted at the Boho Farm. and then put another coat of mud on the kitchen drywall. The things that have the most value to us are often the things that take the longest to come to fruition! We planted pumpkins this year too! But only one variety. I love the varieties you have shown- they are beautiful! We are trying out pumpkins this year too. Fairy Tale and Connecticut Field pumpkins. I think they are growing but yes, slowly.....we'll see how it goes. It is a learning process and I love learning new things! Your heirloom pumpkins are fantastic! What a nice, pretty variety, Caroline. I know you will find all kinds of fun ways to use them. of course i love the "Fairytale" pumpkin! this is the first year I have planted pumpkins. I am very excited to see how they turn out. 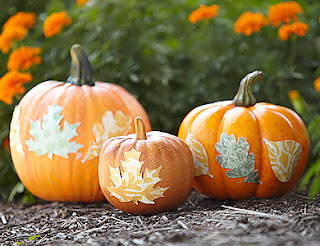 Gorgeous pumpkins! 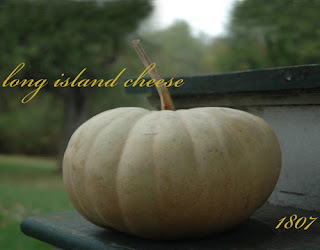 I grew lots of pumpkins last year - so many I was able to freeze lots of pumpkin puree. But this year I've had squash bugs and squash vine borer to battle and only got two Jack Be Little's! Love your pumpkins and I’m surprised they’ll grow in the desert. We grow pumpkins too and toss a handful of seeds out into one of the compost piles and they just grow, we do nothing to or for them. We can’t harvest them until the beginning of October since they’re only now taking off growing. I bet your kids are having fun with them. good luck with your pumpkins! In the past we have planted as many as 44 varieties. They are a lot of work, but when they ripen they are all like works of art! I will admire your instead!! I think your pumpkins are beautiful. A couple of years ago while in Nashville, IN I had a pumpkin scone at a coffee shop, right out of the oven. YUM. She said the recipe came from taste of home magazine. I love your pumpkins! I think next year we are going to try our hand at growing pumpkins. Unless we more ?! Who knows. I am your newest follower! Looking forward to more of your posts. Hi Caroline - oh I'm happy to hear about your post today! 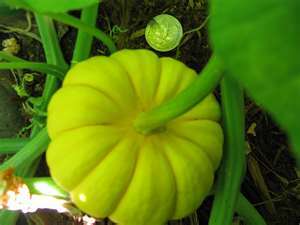 I also planted heirloom pumpkins in my garden box...I planted the seeds around end of June. These babies grow fast, really fast. I was so excite to get lots of flowers on mine thinkin they will all turn into pumpkins. However, after a while, they started slowing down and the leaves dried out fast. So now all I have are two pumpkins, and unfortunately one looks like it's starting to rot. What am I doing wrong...it gets plenty of water. I am so excited. While walking on our property yesterday, I noticed a pile of compost that our neighbors put on our property...they do that a lot. They don't want the unsightly mess in their yard and they think we won't notice it since it's on the back side of the woods on our ten acres. Anyway out of the compost - PUMPKINS!!! WOOHOO. THey look like pie pumpkins. Time will tell. 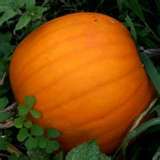 Well, I say every garedner and every garden needs at least a few pumpkins - it's the law :) Your pumpkins look great. 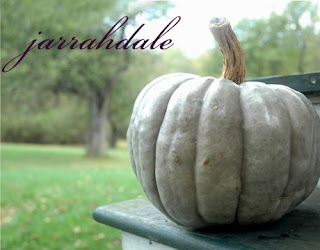 We are a good month away yet for any of our squash or pumpkins to ripen.